U.S. stocks closed lower Wednesday, as disappointing earnings sparked a broad sell-off. The Dow Jones Industrial Average slid 1%, the S&P 500 lost 1.4% and the Nasdaq shed 1.8%. CNNMoney's Fear & Greed Index slid back into 'fear' territory, with three of the seven indicators in 'extreme fear.' The index hasn't been this low since December, when worries about the fiscal cliff caused investors agita. Meanwhile, the CBOE market volatility gauge, more commonly known as the VIX (VIX), spiked 25% to near 17. While that level is still relatively low, the big jump shows just how jittery investors are. The VIX shot up on Monday as well following the Boston terror attack. Wall Street is in the throes of earnings season and this week's reports have been less than stellar. "I don't think we got the sunshine that the rest of the Street was looking for across a wide swath of the companies reporting," said Kim Caughey Forest, senior equity analyst at Fort Pitt Capital Group. "You get not-great news out there and it makes investors jittery." Banks and techs spook investors. Bank of America (BAC) was the biggest drag on the Dow, after it missed first-quarter earnings estimates, despite an uptick in revenue. Higher investment banking revenue was offset by lower mortgage banking income. Other bank stocks followed Bank of America's lead, with shares of JPMorgan Chase (JPM), Citigroup (C) and Goldman Sachs (GS) all down more than 3%. Meanwhile, a disappointing quarterly report from chip maker Cirrus Logic (CRUS), a major Apple (AAPL) supplier, pushed Apple shares below $400 earlier in the day to a new 52-week low. Shares of Yahoo (YHOO) lost ground, one day after the company reported lousy first-quarter sales and issued a downbeat outlook. Intel (INTC) shares bounced back after earlier losses, following the company reporting earnings and sales in line with expectations. The company reported another decline in chip sales for PCs, however, with revenue from that business falling 6% compared to a year earlier. 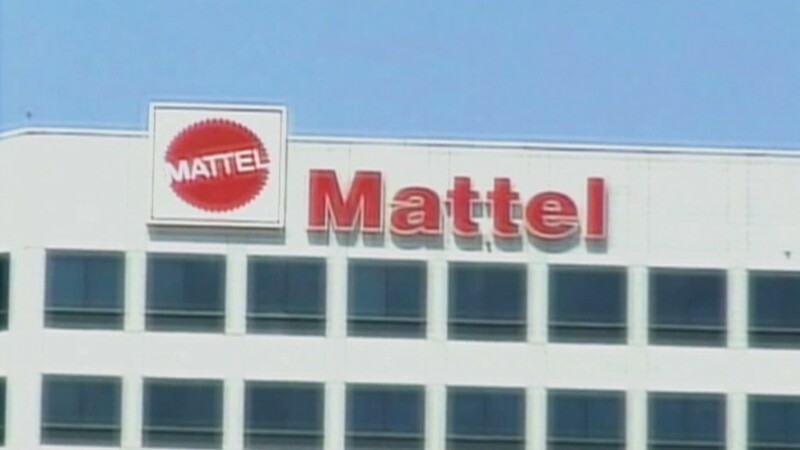 On the flipside, shares of toymaker Mattel (MAT) shot up Wednesday after it reported that its first-quarter net profit more than quadrupled. Fairway Group Holdings, the parent of Fairway Market, priced an initial public offering at $13 a share -- above its estimated range. Shares, which started trading Wednesday under the ticker FWM (FWM), rallied nearly 31%. Both American Express (AXP) and eBay (EBAY) reported earnings after the close that beat forecasts. But sales for each missed. Shares of eBay were down nearly 3% in after-hours trading. AmEx was down about 1%. Jitters from Monday remain. It's only Wednesday and it's already been a rough week for investors. Weak economic news out of China and the Boston terror attack sparked one of the biggest one-day sell-offs of the year Monday. A strong housing report led a big rebound Tuesday, but investors are still on edge. Gold prices have also been part of the volatility story. On Monday, gold prices plunged to a two-year low in their biggest sell-off in decades. Gold was down slightly Wednesday after staging a modest recovery Tuesday. European markets closed lower Wednesday, dropping for a fourth consecutive session, while Asian markets ended mixed. The Nikkei added 1.2%, while the Shanghai Composite and Hang Seng were little changed. The dollar was higher versus the euro, the pound and the Japanese yen. 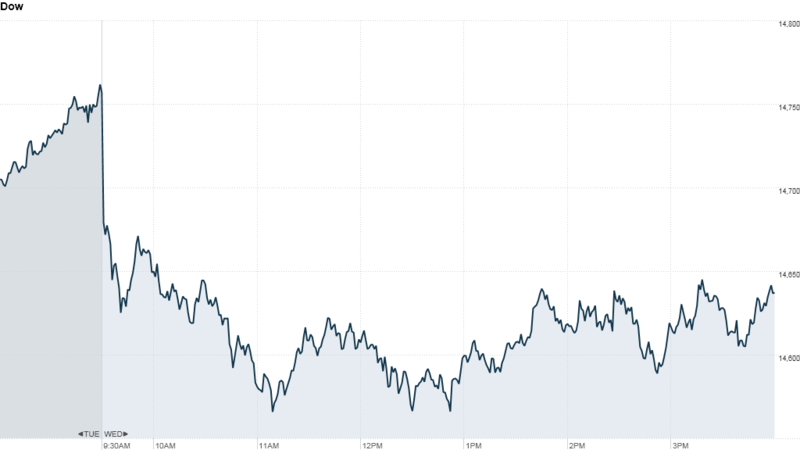 The price on the 10-year Treasury rose, pushing the yield down to 1.70%.